Cookies! Ooooh…cookies! More gluten-free cookies for this cookie monster to just…devour. Mine…all mine. I was hanging out in Columbus, Ohio, visiting my friend Jenn, when she took Cathy and I over to her local natural food store, praising them for the huge gluten-free selection that they carried. I was hard pressed it could be anything beyond what we have around here, but I was instantly schooled. She was completely correct…The Raisin Rack in Columbus, Ohio, went above and beyond all my expectations for a gluten-free selection. It was huge. And there were items I hadn’t seen in my own area before. Call me one happy girl. I piled a basket full of goodies…one of which was a box of Annie’s Homegrown Gluten Free Ginger Snap Bunny Cookies. While we do carry some gluten-free bunny cookies from Annie’s Homegrown, I hadn’t seen the Ginger Snap variety in my area as of that time. I’ve since found it, of course. But…that’s beside the point. With a lot of fresh fruit items and other products that were in the pantry that would expire first, these cookies just sort of sat on the shelf. But after having to cancel my CSA bin this past weekend and having worked through everything else, when I was putting lunches and snacks together for today, these cookies were getting their time to shine. I opened up the box and weighed out the contents to a perfect serving. I snapped a lid on the container and took them to work with me to enjoy for my morning snack. I eyed the little container all morning, glancing at the clock just as often, already anticipating these cute little cookies. When the time finally came…I lifted off the lid and grabbed one of the little bunny shaped cookies. One bite…and that was all I needed to know that I had hit a jackpot with these cookies. The Annie’s Homegrown Gluten Free Ginger Snap Bunny Cookies were very reminiscent of my childhood where I could eat Teddy Grahams and Graham Crackers like they were going out of style. That’s what these little bunny shaped cookies reminded me of. Especially the graham cracker thing. I was a child that didn’t need the peanut butter of the chocolate and marshmallows for my graham crackers. I loved to eat them just the way they were…plain and right out of the sleeve. 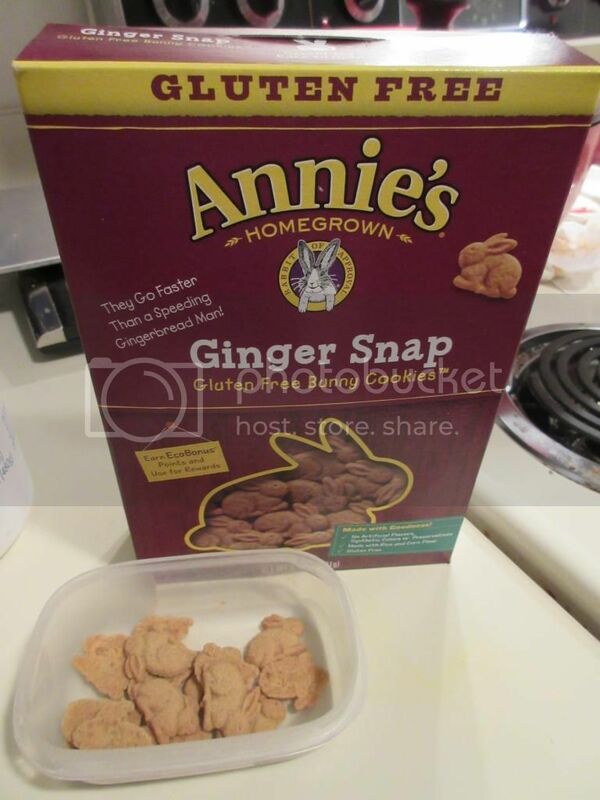 The initial flavor of the Annie’s Homegrown Gluten Free Ginger Snap Bunny Cookies takes me back to that…and then a bit of sweetness from the ginger comes through right at the end. It’s a nice play on the taste buds. I was elated and had to resist grabbing the rest of the little cookies in my palm and just shoving them all into my mouth and chewing for 5 minutes to completely chew them up and safely swallow. Because…it was tempting. But…I took my time an savored. These were fantastic little bites of cookie goodness for sure. So, let’s talk about the ingredients. The Annie’s Homegrown Gluten Free Ginger Snap Bunny Cookies are made from rice flour, yellow corn flour, organic brown cane sugar, palm oil, tapioca starch, crystallized ginger, molasses, soy flour, corn starch, natural butter flavor, organic tapioca syrup, ginger, salt, soy lecithin,guar gum, and baking soda. The ingredients are all grown and processed without GMO’s. These cookies are gluten-free, peanut free, dairy free, egg free, tree nut free, nut free and vegan. A serving size of Annie’s Homegrown Gluten Free Ginger Snap Bunny Cookies is 29 cookies (or 30 grams). This serving will provide you with 130 calories and 4 grams of fat. These cookies contain 55 mg sodium and 8 grams of sugar. Not bad for cookies. Also, a serving will provide 1 gram of fiber and 2 grams of protein. You won’t feel very full after eating them, but, boy, they sure are delicious. These cookies were so amazing, not only because they reminded me of things I grew up eating and used to be able to eat, but because, on their own, they stand out as a tasty, delicious, bite-size cookie treat. The flavor was perfect – not too much ginger, but not too little either. It certainly brought balance to each bunny-shaped treat. I am totally in love with these and will treat myself to them again sometime. No doubt. This entry was posted in Cookies, Dessert, Food, Gluten-Free, Products, Review, Snacks, Sweet Stuff, Vegan, Vegetarian by The Celiathlete. Bookmark the permalink.